"Both of my parents were atheists, and I found the way to God all alone on my own. You have to invite him, so that he shows up." I do not want anyone out there proselytising, but I have no doubt Nina is serious. In fact, I know she is serious. Since Hagen is a singer, what better way to share her conversion than by releasing a gospel album. No, really. 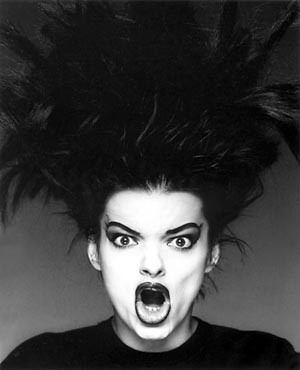 In August, Nina Hagen will release Personal Jesus, her first gospel album. I got an advanced copy of Personal Jesus, and I was trepidatious about listening. I grew up in the South where gospel permeates the air we breath. Catholic, Protestant, Jew or atheist, if you grew up in Alabama, chances are you know the words to a dozen hymns whether you know it or not. I must confess, Personal Jesus is currently my favorite CD of year. It has officially moved my favorite purveyors of hick-hop, Gangstagrass, to Number 2. Hagen's voice sounds like a modern Mahalia Jackson. The CD is a mix of soulful blues and rocking pop, with a touch of folk. There are traditional hymns like Just a Little Talk With Jesus and I'll Live Again. Her cover of Woody Guthrie's' All You Fascists is great and her cover of Depeche Mode's Personal Jesus is second only to Johnny Cash. Even if you don't know a single hymn and you are a big old atheist, this CD is well worth a listen. I don't give much thought to those people who invest a lot of time in predicting the end of the world. Since the beginning of time, some old crackpot has announced its end. The current eschatological darling is December 21, 2012. On this date the world will end -- because the Mayans said so. and, also, black holes will align or perhaps the Planet X will crash into earth. WE ARE DOOMED! But just to hedge their bets, some of these 2012 end-timers offer the hypothesis that if the world doesn't end in a gigantic cataclysm, there will be a consciousness shift. Given the choice of doomsday or a harmonic convergence, I'll choose the later. In the last year Bob Dylan released a Christmas CD and Nina Hagen released a Gospel CD. Draw your own conclusions. gotta get this one! thanks for the tip Lucinda. NINA!!!! He is Risen just like He said HE would!!!! Get excited Sai Baba is on life support and will be dead soon. All the other god men have died and bodies burned. Where are the other so called avatars of God? Havent seen them in Years because they ALL died and rotted in their graves. I have seen Him!!!! I have seen JESUS and HE sure Aint dead!!!!! HE IS ALIVE!!!! He is THE Life! So happy you saw the light and got saved I LOVE YOU NINA!!! Preach it Sister!!!! It's crap. Don't bother. Sorry Nina. But it's complete crap.